Upwave is a cloud-based platform for collaborating on projects, innovation processes and daily tasks. Get more done with intuitive visual boards that are based on sticky notes. Easily drag and drop tasks between columns to visualize progress. 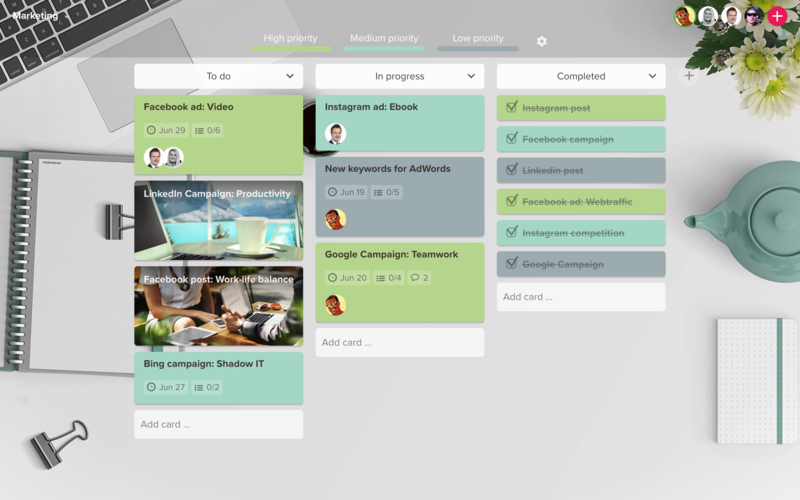 Define your own structure with columns, rows and cards to organize what everyone’s doing. Upload background images for each board to give it a personal touch. Use cards to describe a task or an idea. Divide complex tasks into small subtasks so nothing falls through the cracks. Set deadlines to keep your priorities straight. Staying on track without clear and open communication is impossible. Assign tasks, comment, upload files and get real-time feedback from your team. In the rapidly changing global business environment, continuous innovation is key to succeed. Innovation doesn’t have to be new products or services, it can also pertain to new business models, processes and functions. Visual strategic frameworks help you see the big picture and put the pieces together in a logical way, while facilitating brainstorming and knowledge sharing within your organization. Visualize your entire business model on one page. Use the Lean Methodology to identify problems worth solving. Identify your strengths, weaknesses, opportunities and threats. Setting up your account takes less than a minute. © 2019 Upwave Technologies AS. All rights reserved.